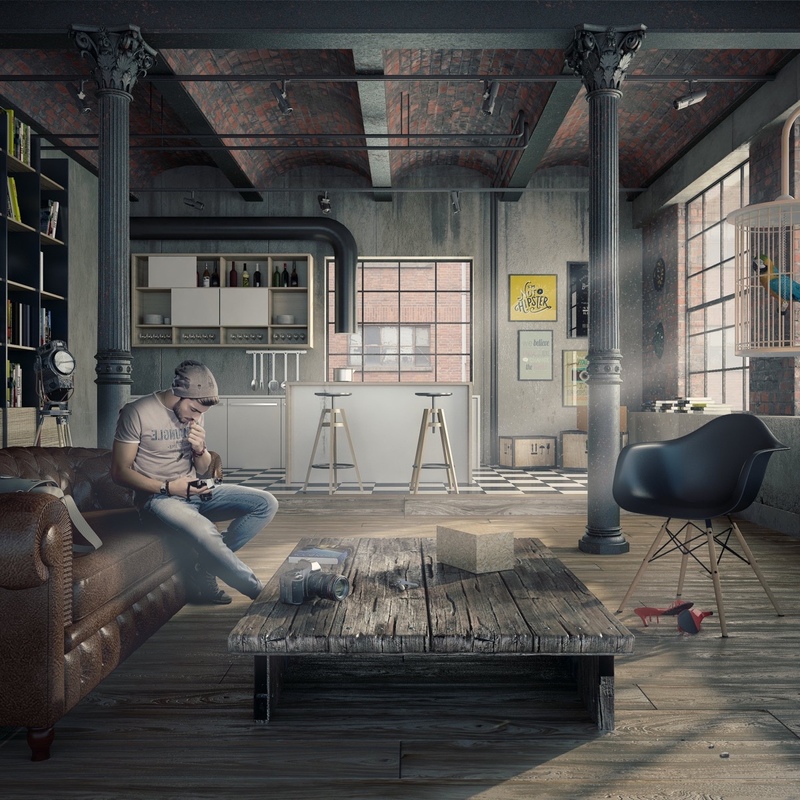 In this collection we've put together some of the entries of the Evermotion 'Whole Lotta Loft' competition that are sure to blow your mind. 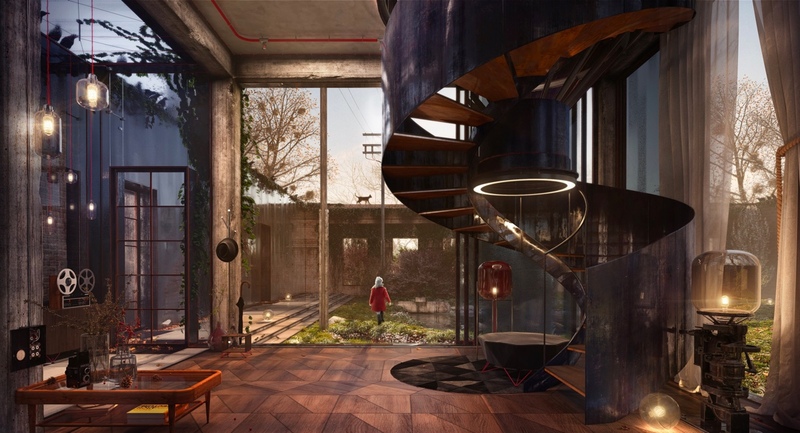 Incredible designers from the world over have poured their hearts, souls, and creativities into these spaces - and you won't believe what they've come up with. Explore ultra modern, boho chic, old airplane hangers, and even a loft with a seaworld sized aquarium. While some of the design elements you may be able to incorporate into your own space - this post is really all about dreaming. So take a tour, and see what we're talking about. 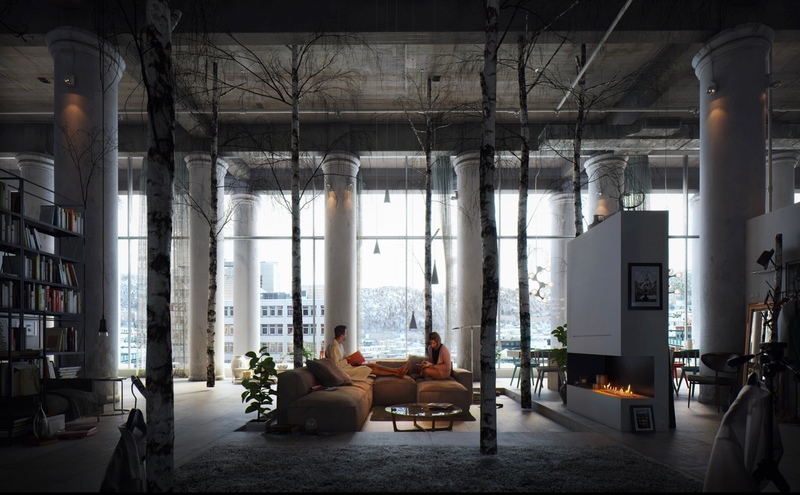 This loft is like an atrium – with a tree in the middle, and rocks bulging out the back wall it’s as if they’ve placed the glass right on top of a park and built around it. A stunningly open, modern, and organic space. A night at the museum? How about a night in here? 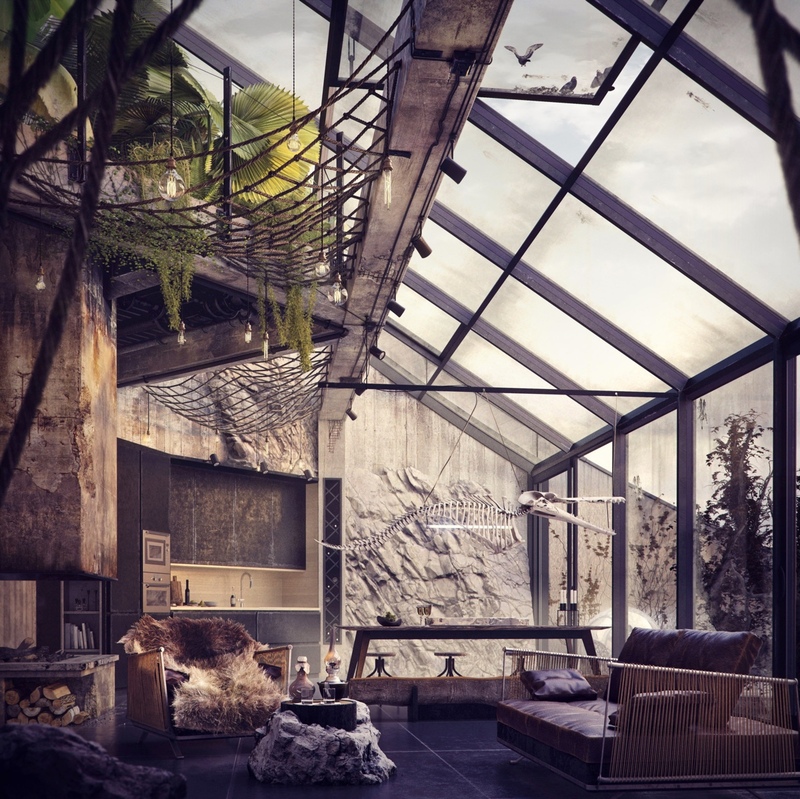 This lot looks like something out of an ancient cave – with the rocks, hanging fossil skeleton, and the mossy, dropping plants. We also love the rustic fireplace and how it looks like a caveman has draped his cape over the chair. This place is eclectic and charming – with bright colors, stunning art, and that industrial chill feel you expect from a loft. 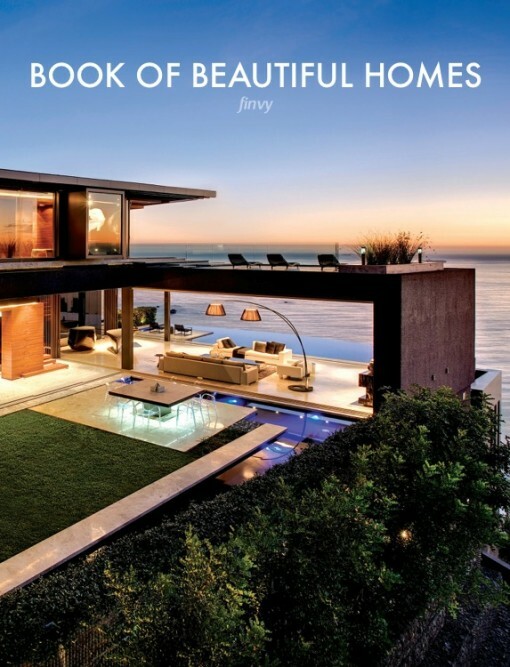 Not only is this space incredibly large and imaginative – but the view is a show stopper in itself. 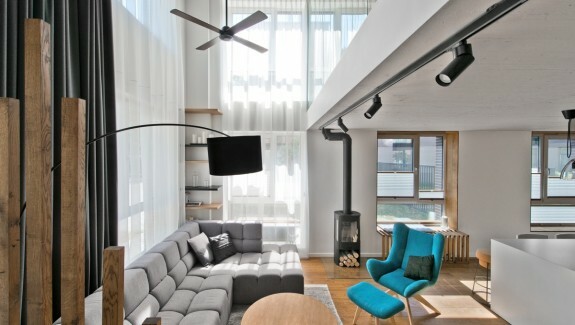 We love how every angle of this loft space takes advantage of it, and how the warm spot lighting contrasts against the deep blue sky. 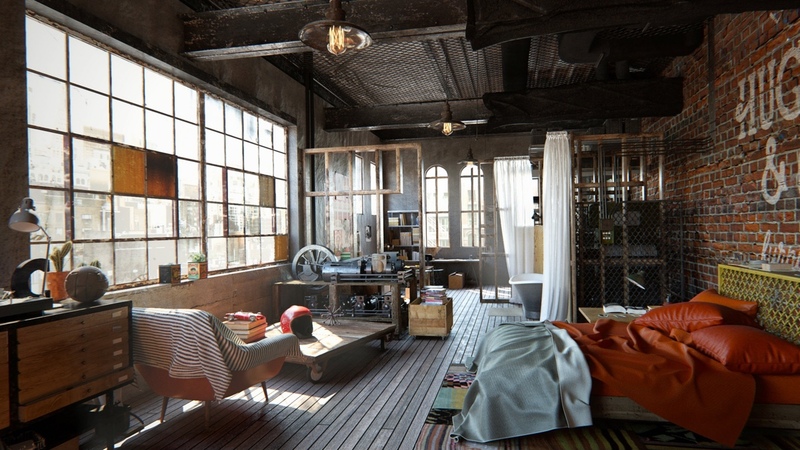 We love the industrial old world vibe this loft gives. With the classic brick walls and exposed beams, you feel transported back to an old factory – except better because now it’s impeccably designed. 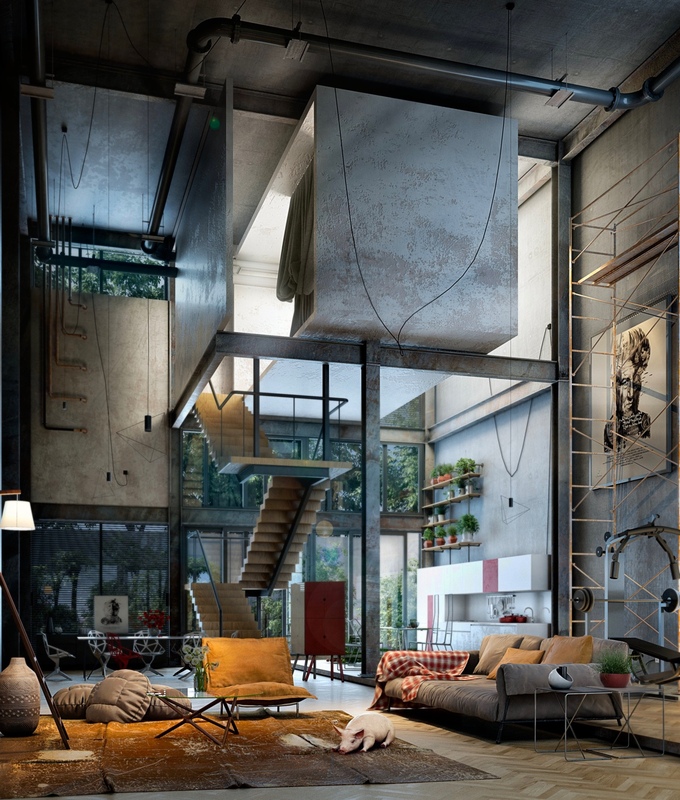 We love this loft because it looks like a real space anyone would love. With a desk area, scattered books and shelves, and a tilted shade – it’s like any 20-something could call this chic loft home. Get your zen on in this wide open loft. We adore the light fixtures here, including the hanging fans. The giant windows let in beautiful light and we love how the brick is a faded color – playing off of the wide planked light wood floors. Talk about chic! 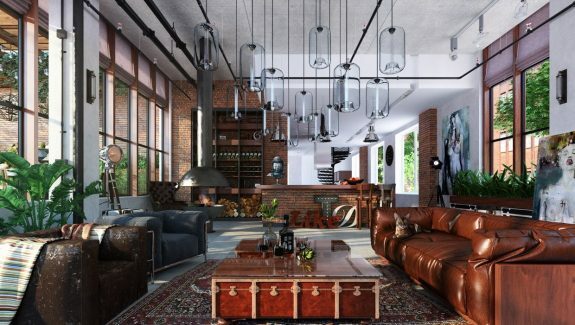 This masculine space plays off of the exposed pipes with shiny tiles, cool industrial furniture, and lamps with swooping curves and lines. This is a ‘wow’ space. The ceilings alone can take your breath away – and we love how the visualizer has played on that old world feel with the oversized leather couch, a hanging bird cage, and even the old studio lamp in the back. The contrast of old and new is stunning. 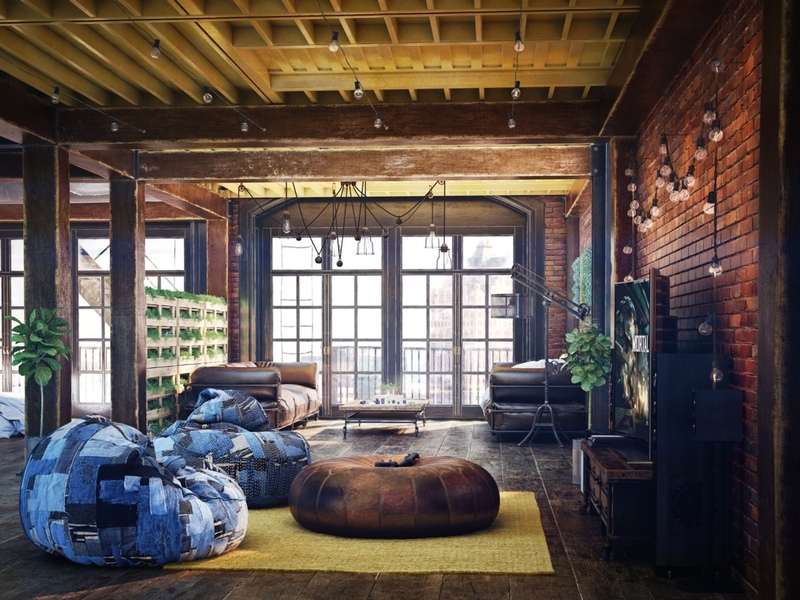 This entire loft looks like a playground for adults – and we love it. 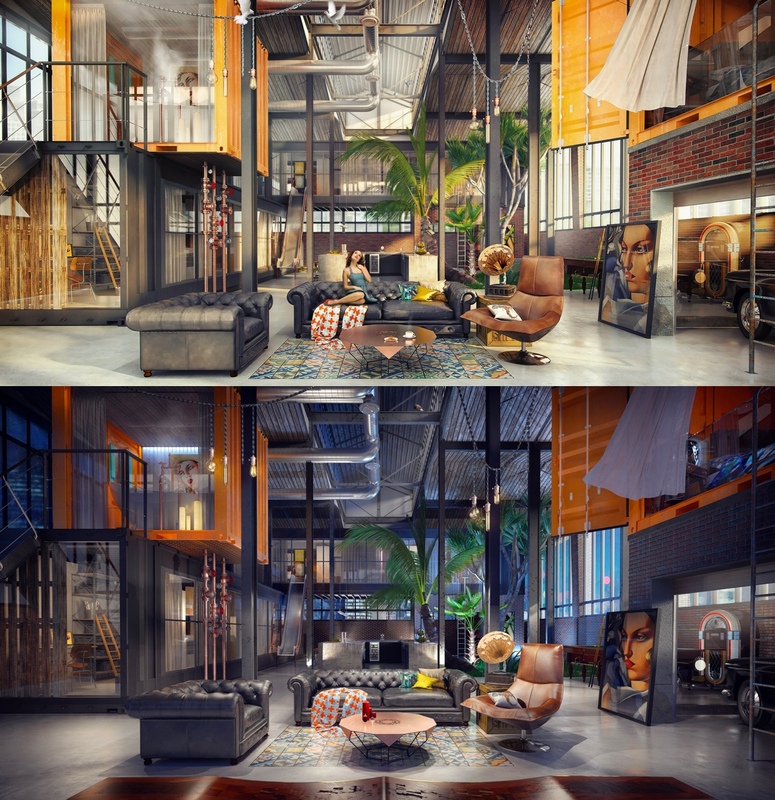 From the catwalk on the left, to the slide and climbing wall on the right – this loft has no shortage of fun factor. 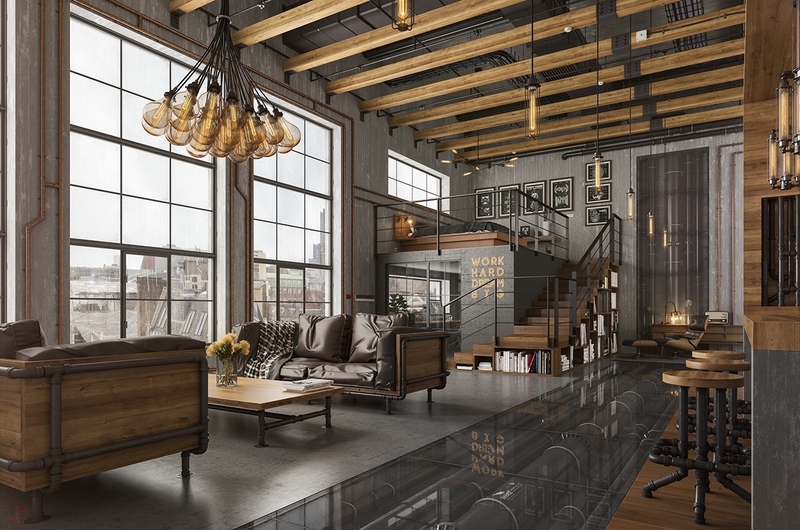 A classic, masculine, and industrial loft – this space boasts soaring ceilings and concrete floors that will make any classic loft lover swoon. 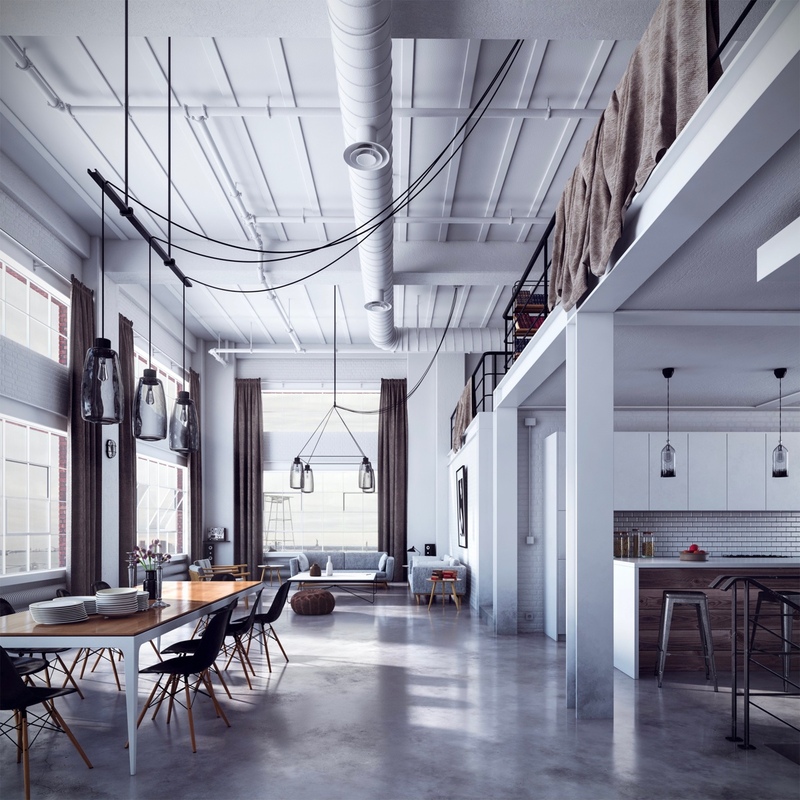 We love the casual feel of this loft. From the colors to the old dirty windows – and even the curtain separator in the bathroom. It makes this space feel like the lofts we used to love – a bit ruggeed, absolutely industrial, and a once commercial space totally transformed. We love the darkness of this loft – because when the light pours through the windows it really shines a light on all the details. 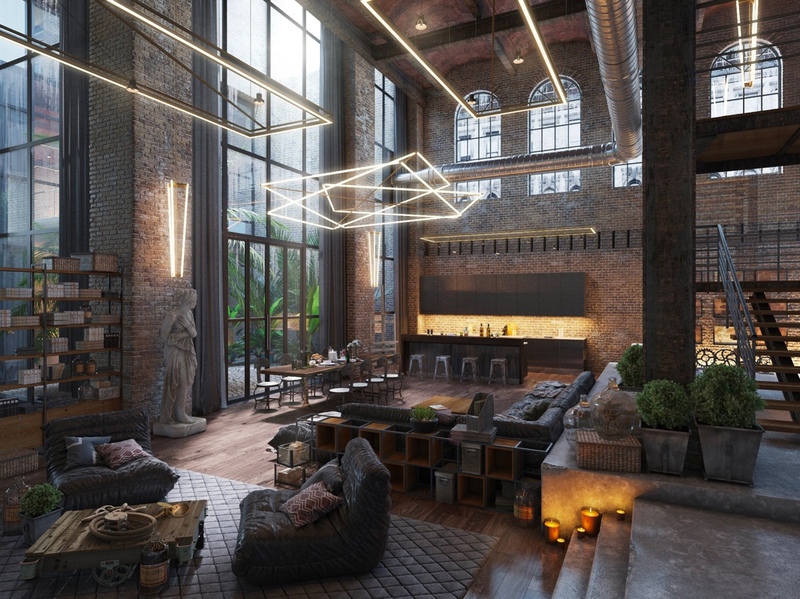 The massive brick walls are a piece of art on their own – but being bolstered up by those massive beams this space screams old-school loft. The window and the wall around it really set the stage for this loft – with it’s curves, the molding, and the flaking paint it looks like a part of the old world has really been kept here. Then the industrial comes in with that steel beam holding up the loft, and those pipes running through the kitchen. This loft has a retro feel that we adore. With it’s stunning stairs to the mustard yellow, the globe chandelier and the geometric bookshelf you can’t help but be brought back to the 60’s. We love this loft because they’ve brought the windows inside – separating the spaces yet keeping that open feel we love about lofts totally in tact. This loft space looks like it could be a suburban home – but instead it’s just been transformed. We love the beams crossing on the ceiling, and that giant window in the back mixed with the super modern staircase. This ultra modern, white, minimalist space is a stunner. We love how the brown pops agains the stark white – and the sleek furniture. 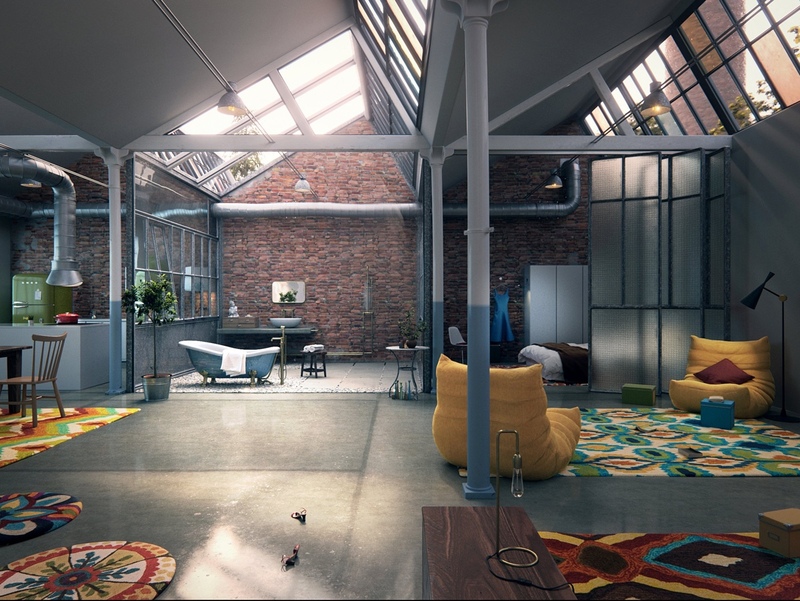 A creatives retreat – this loft has plenty of space for inspiration. From the recreated street art on the wall, to those floor to ceiling windows – you can’t get enough of what this space has to offer. This loft has a boho chic feel we can’t get enough of. 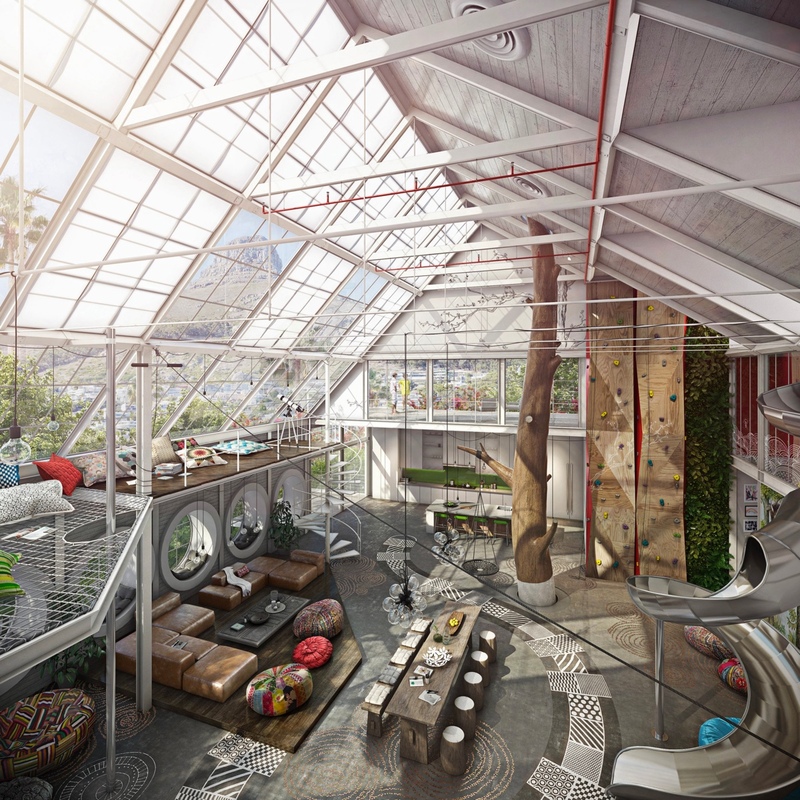 With a bungalow roof and couches that look like bean bags, this is an incredible space for some yoga and relaxation. We love the staircase in this loft – its absolutely the centerpiece of the space. The swooping sides and the stunning light around it really makes it stand out – yet blend in with the rest of the warm space created here. 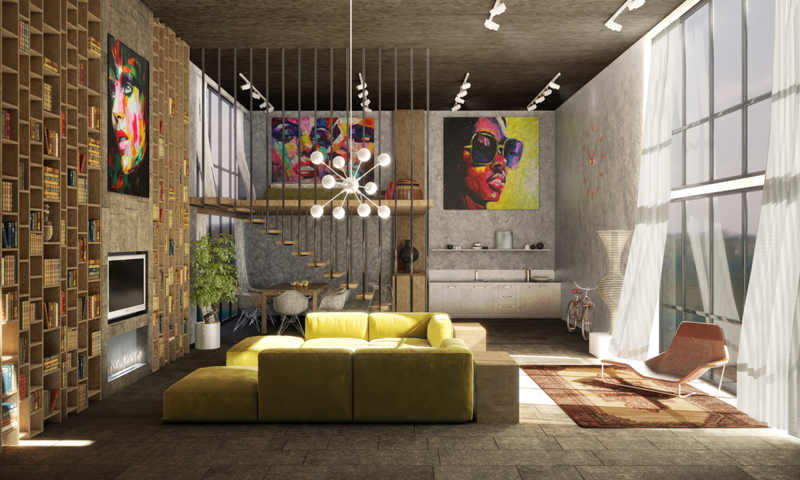 This loft is light, bright, and colorful. We love the accents of blue pink, and orange, and how their pastel color looks against the concrete walls and flooring. 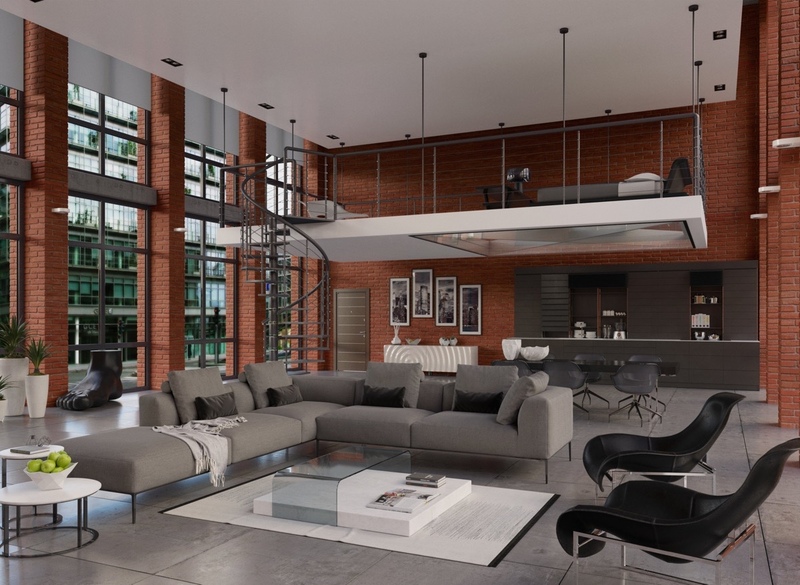 This loft is a phenomenal space. We love the insanely huge windows, and the arched windows above the kitchen area. The entire space is mix of modern and old world – and we love how the lighting here – whether it’s the windows or fixtures – illustrates this. Well – that’s something we’ve never seen before! Exposed beams and piping are the norm inside a loft – but a floor that looks right down onto them is another story. 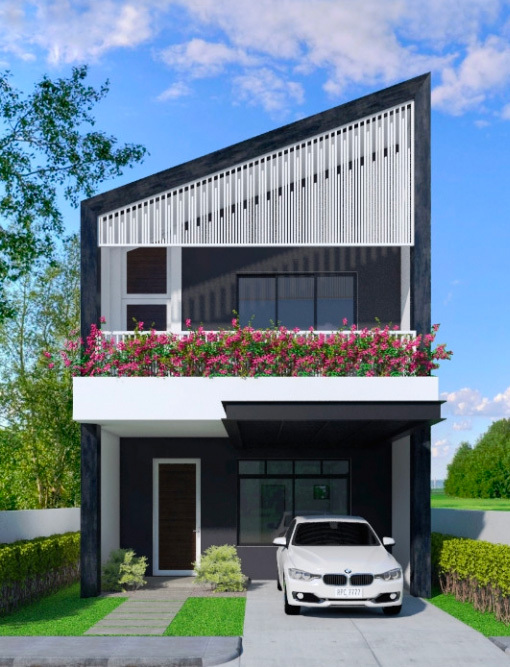 We love this creative design element. 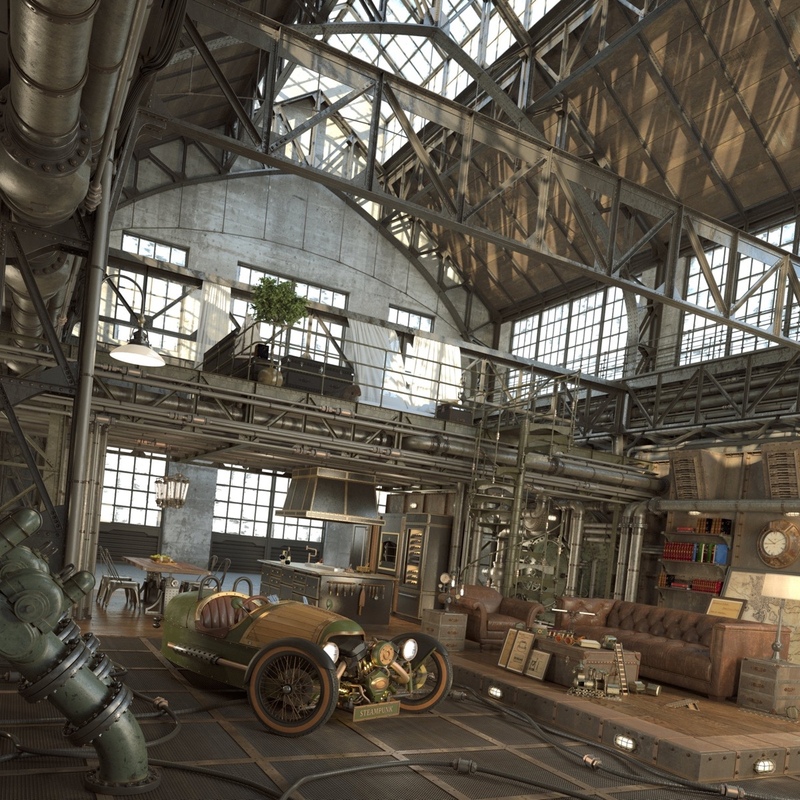 Bonus points for the cool industrial style lights. The walls and ceilings of this loft have been dipped in this awesome steal-y blue. 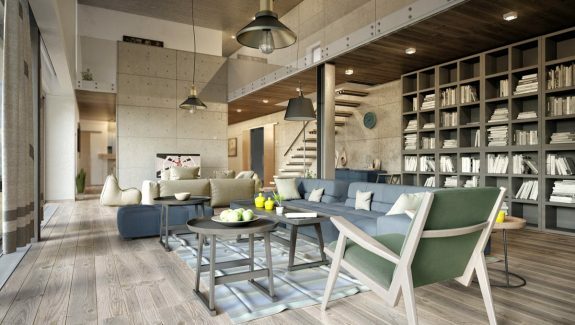 From the crumbling walls to the steel beams – it all has this cohesive element despite their major differences in materials. This loft is super eclectic and we love the vibe. The Persian rug, wall art and floors covered in trinkets – seemingly from travels – makes this space one you want to sit and listen to stories. Like right out of an old church – this loft stand tall and strong. 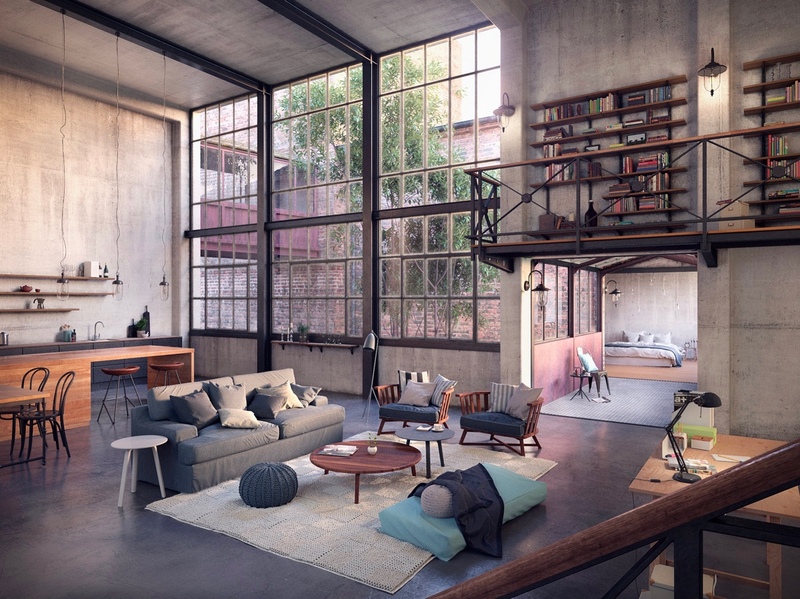 Taking full advantage of the incredible ceilings, unique windows and arches – this loft keeps it simple so all you focus on are the architectural wonders. 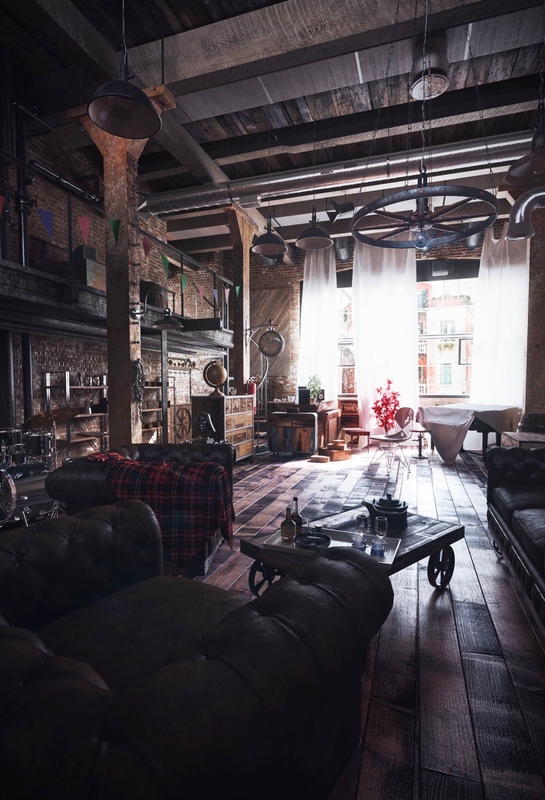 Given the first prize in the Evermotion loft visualization contest – this steampunk inspired loft is out of this world imaginative. 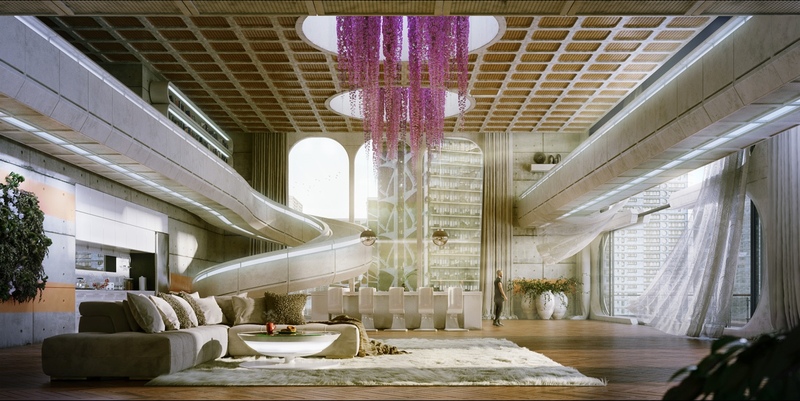 Everything has been thought of intensively here, and given it’s own very unique design. 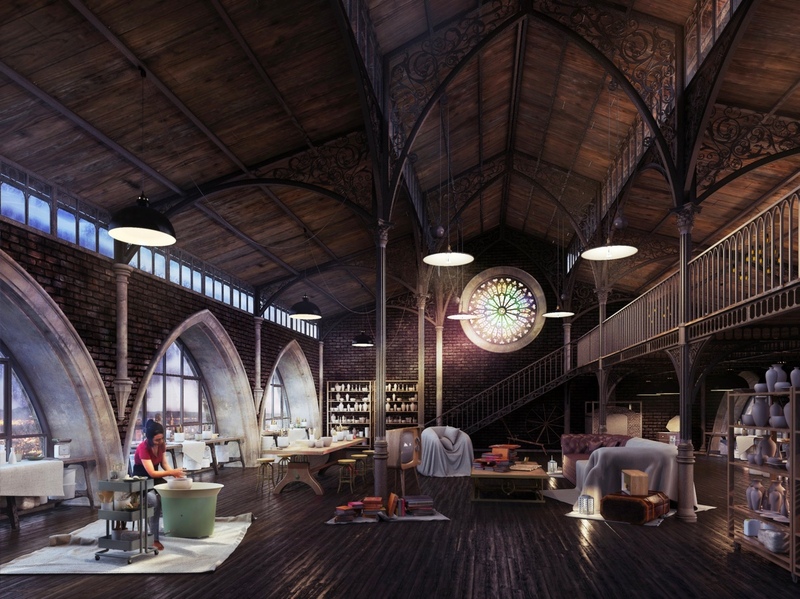 You can’t help but fall in love with the dream behind this loft. 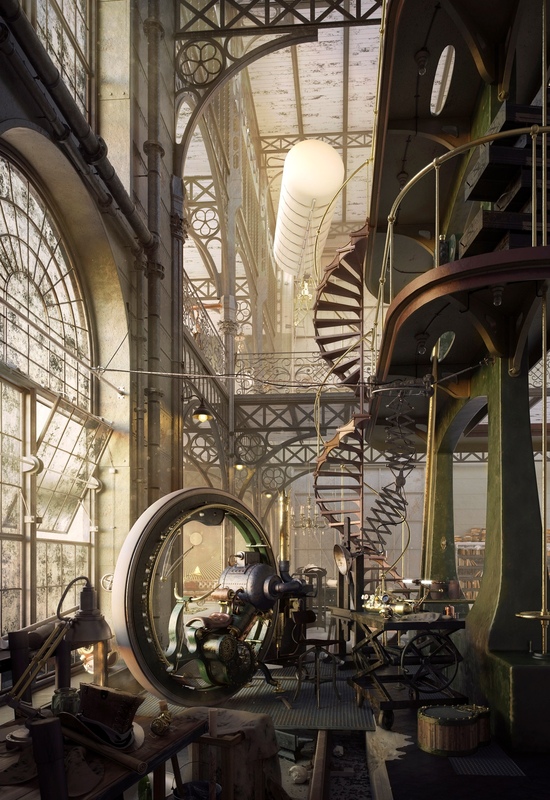 What looks like an old meat factory has been transformed into a tinkerers paradise. 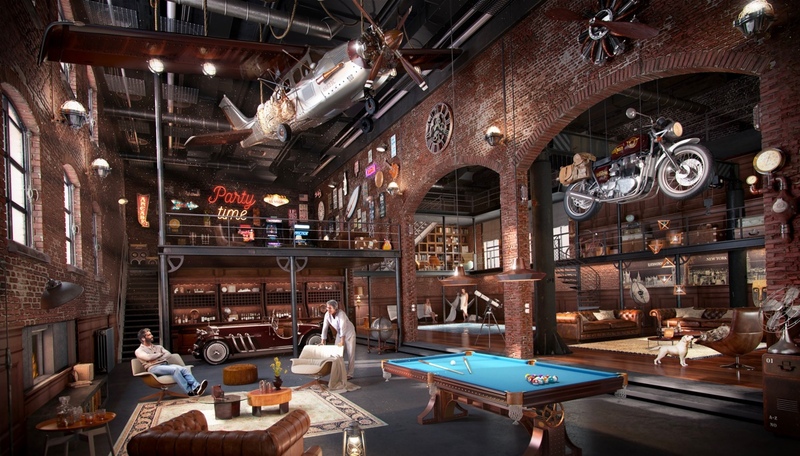 It’s almost like a man cave with the plane and hog hanging – plus that pool table and bar. Let’s just say we’d like to kick back with a cold beer here. 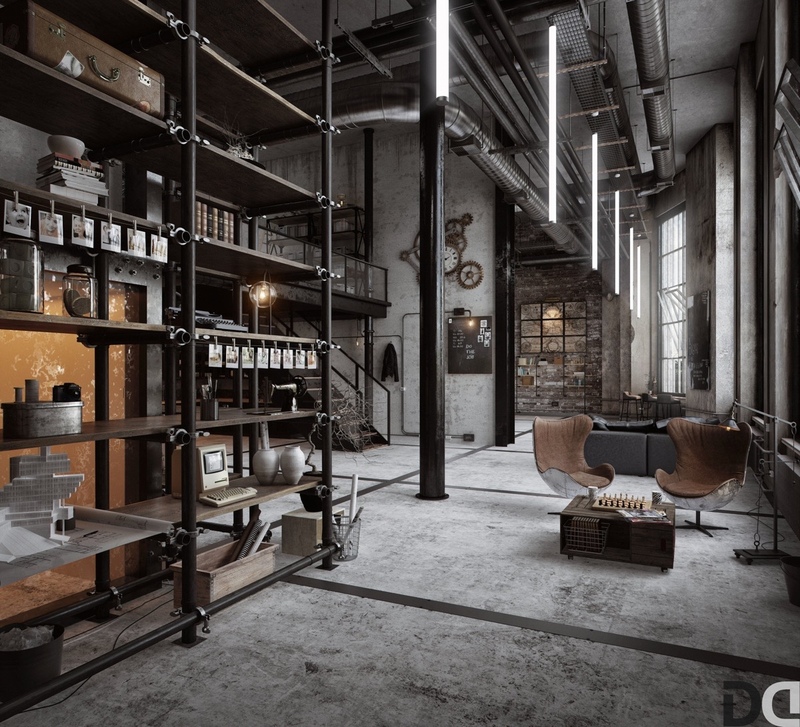 This loft is also a steam punk design – but quite different than the other featured above. 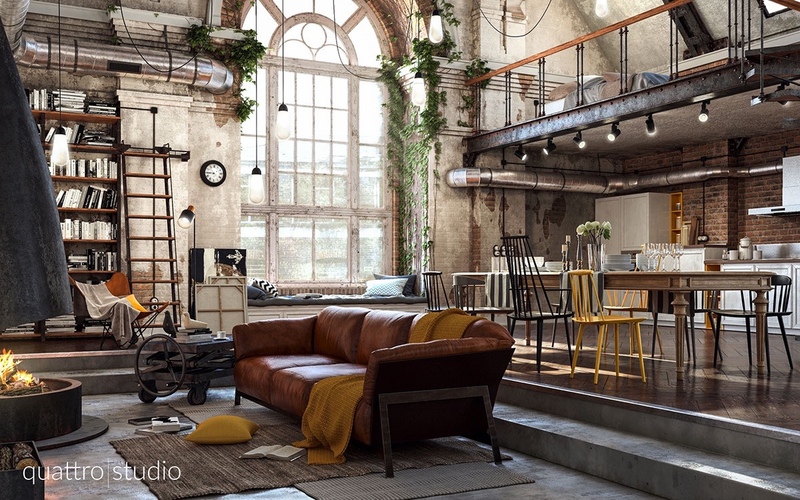 With a much bigger space to work with this loft boasts more of the classic loft design elements we love with the steam punk flare that makes this space stand out. Is this a night club or a loft? That incredible staircase lit up like a runway looks like something you’d see in London or New York. And that pink chandelier glows magnificently like a work of art. 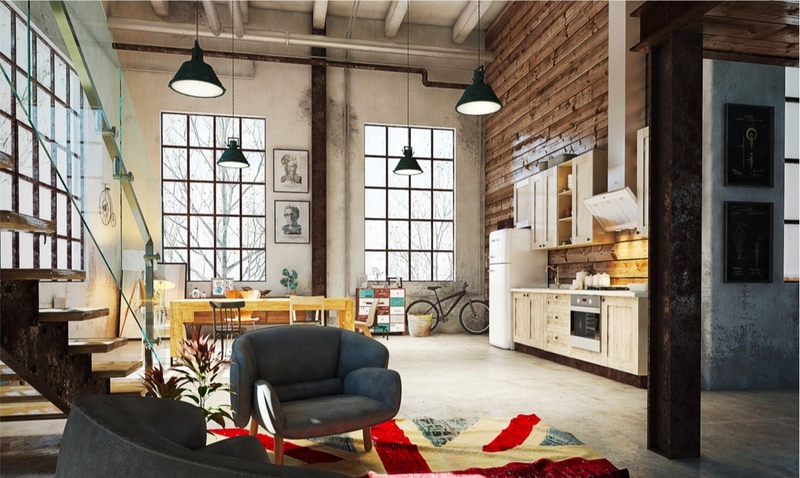 This loft has a country flare. 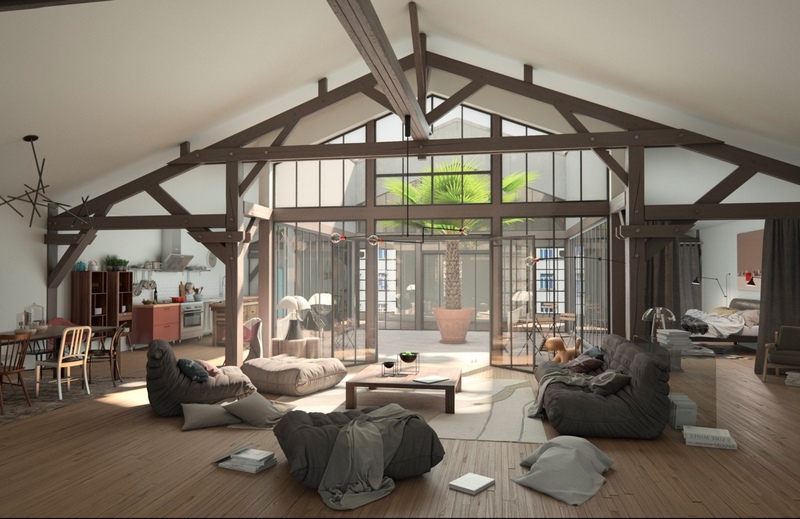 Set on the screen of a wooden cabin, this loft takes advantage of the character with beautiful wide planked wood, and an amazing peaked ceiling thats shiplapped. A loft is often propped up by timbers – but not ones so unrefined. 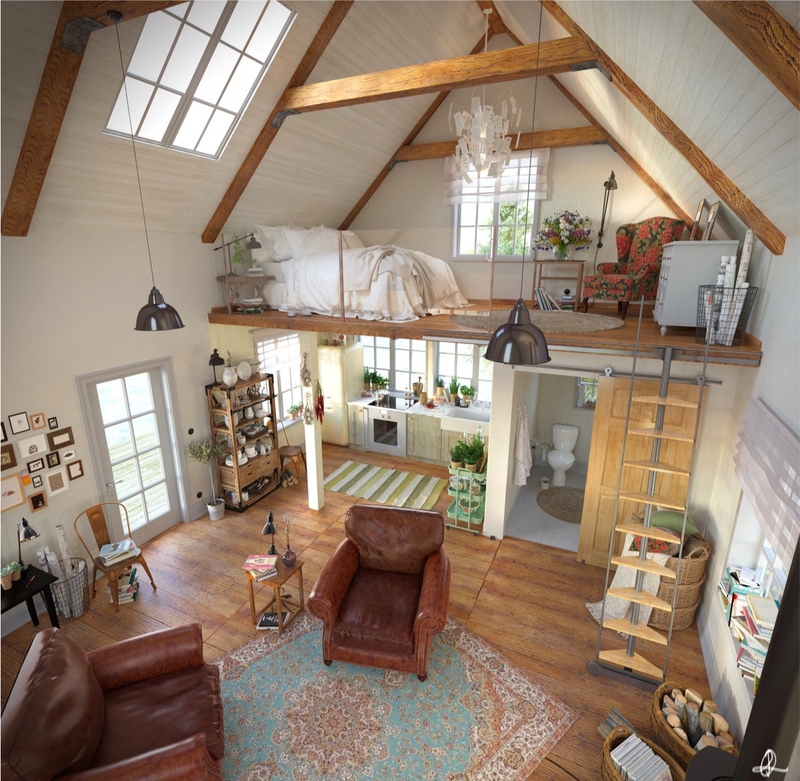 We love how the visualizer has used real birth trees to bolster up this loft. Their trunks are sleek, thin, and modern like the rest of the space. 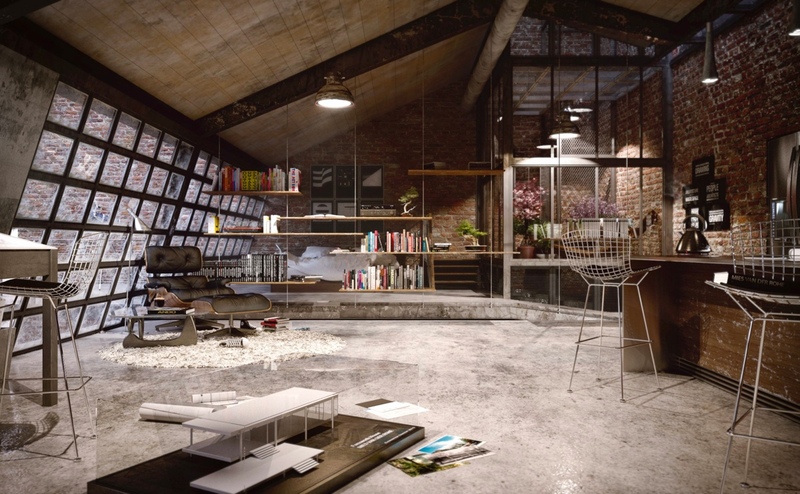 We love how this loft looks like an old hanger – or at least where the built something massive. 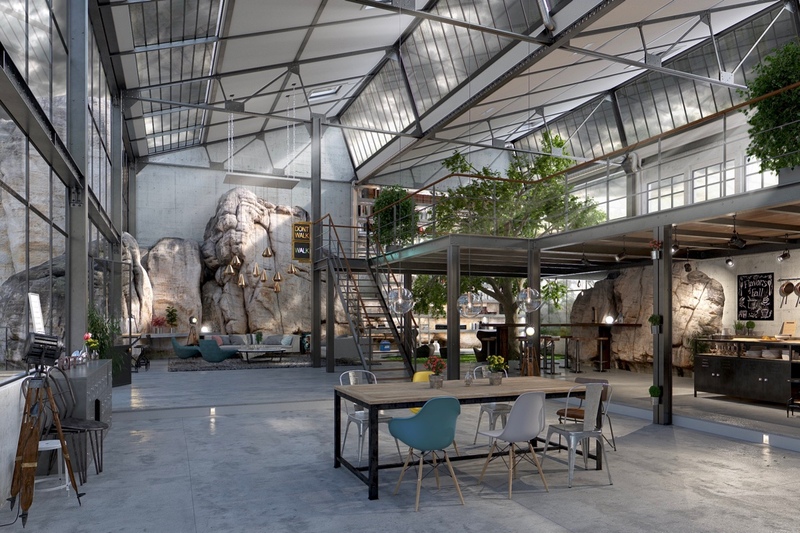 With scaffolding still up on the right wall, and cables hanging every which way – this industrial space is warmed up with oversized comfortable furniture and bright colors and plants. 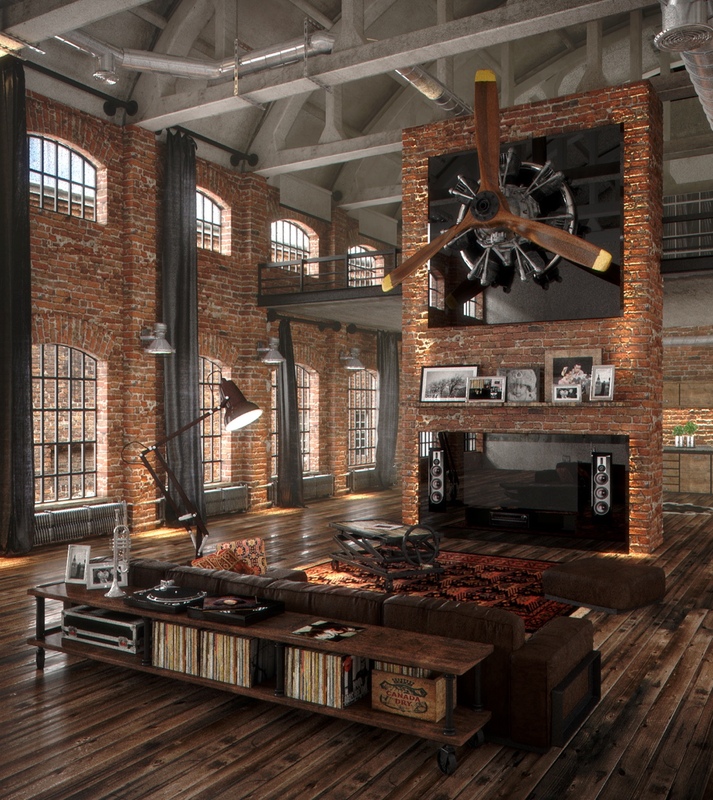 The brick walls really take center stage in this loft. They’re rich, a bit tattered, and they pop against that white vaulted ceiling. 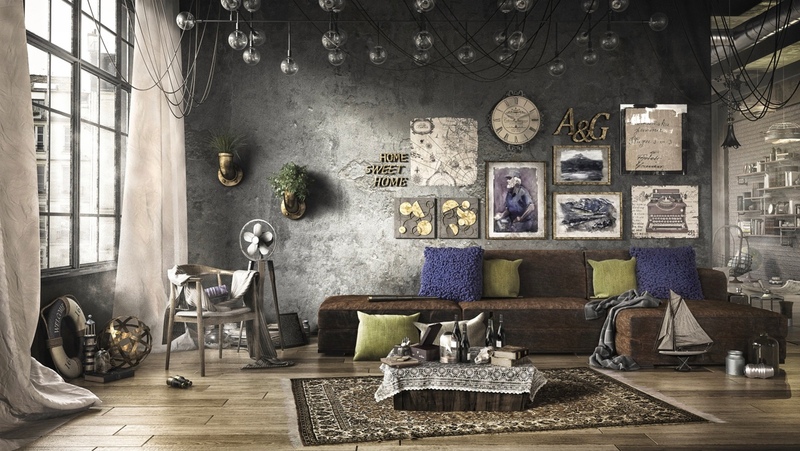 We love the mix of modern, retro, and classic style here – from the couch to the lamp and that big Persian rug. 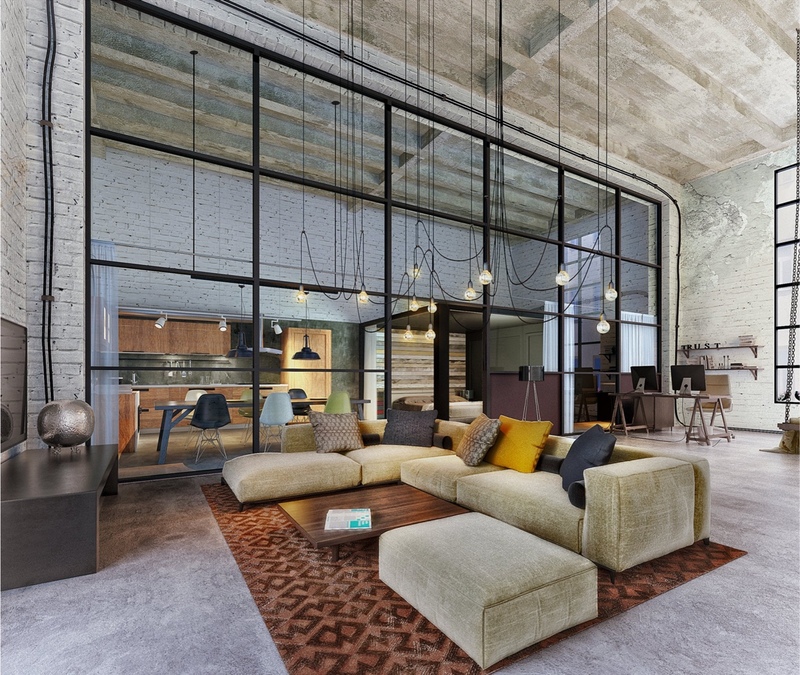 This is as modern as lofts can get. 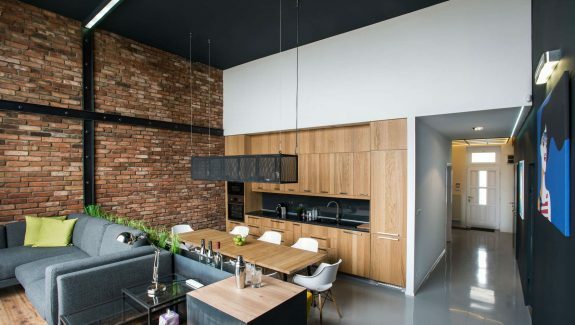 Nice crisp bricks, a hanging loft instead of a beamed one, and concrete floors that have been cut into large tiles make this space unique. 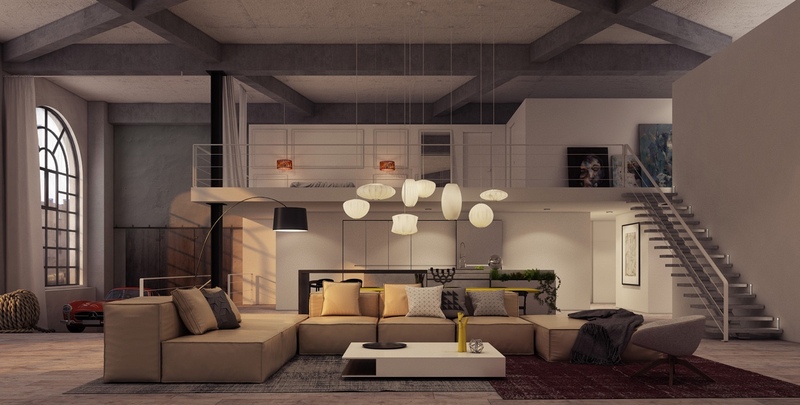 We love the angles of this loft. The windows are slanted, the ceiling then slants back the same way – only to the vault upwards. 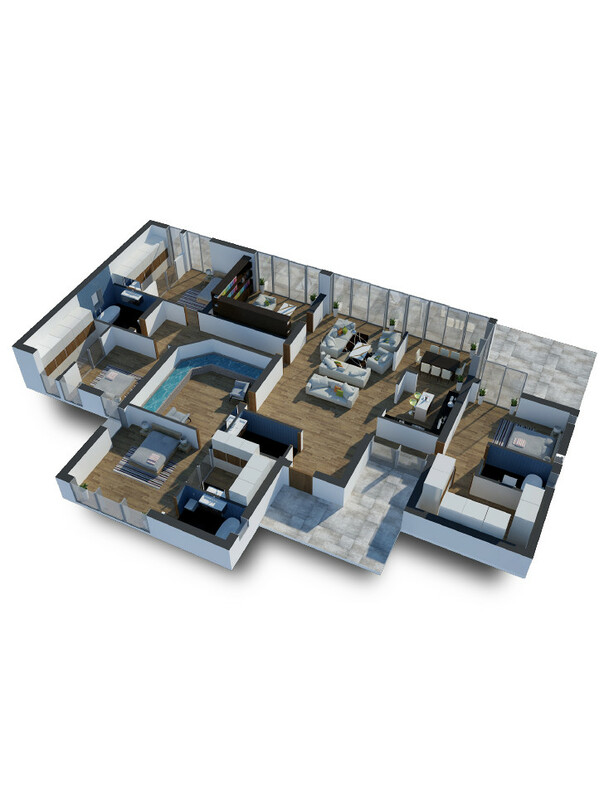 The rest of the space is minimalistic, leaving the focus on the space itself. We love the old feel of this loft. 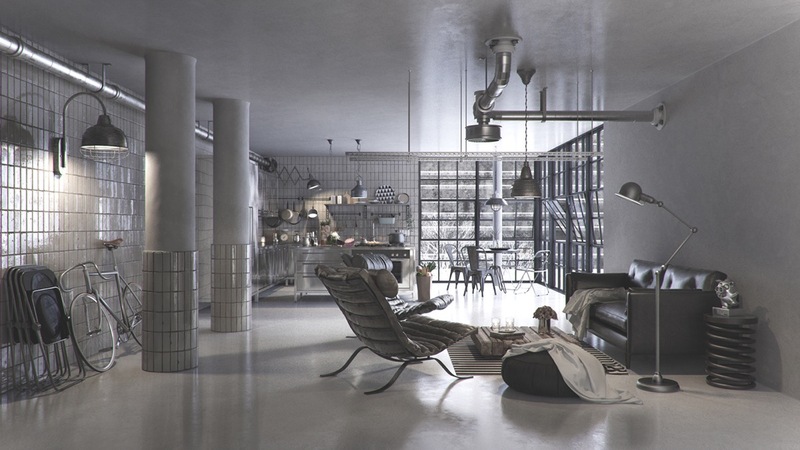 Not just the old pipes, shiplapped walls, or the rusty beams – but the hanging lamps, the retro inspired chairs, and the fridge looks like it’s out of the ’50’s. And finally a bit of whimsy! 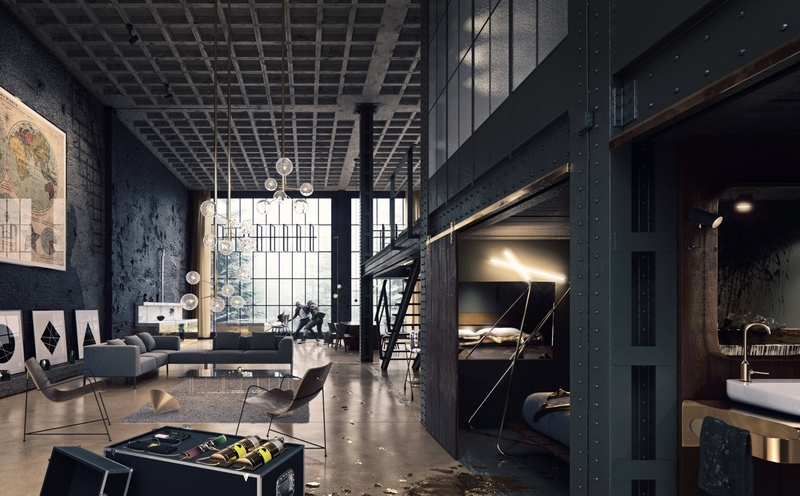 This loft is entirely built around a fish tank fit for any aquarium. Imagine living, eating, and cooking surrounded by such beauty from the sea. The incredible blue hue leaves you feeling refreshed and intrigued, and we love how the water glows against the bricks.